Chief Smith resides in Brownsburg, Indiana. He has been a Hendricks County resident his entire life. Chief Smith graduated from Brownsburg High School. After graduation, Chief Smith attended Huntington College where he studied Sociology and Psychology. He later attended Ivy Tech State College where he obtained an Associate’s Degree in Public Safety Technology. In 2011, Chief Smith obtained his Executive Fire Officer degree from the National Fire Academy in Emmitsburg, Maryland. Chief Smith entered the emergency services in 1981 as an Emergency Medical Technician with a private ambulance service that provided ambulance transports to Washington Township, Pittsboro, and Lizton fire departments. Shortly after beginning his work in EMS, Chief Smith joined the Brownsburg Fire Department as a volunteer firefighter and three years after serving as a volunteer, was hired as one of the first three career firefighters at Brownsburg. Chief Smith progressed through the ranks at Brownsburg serving as a firefighter/EMT, Lieutenant, Captain, Battalion Chief, Division Chief, and acting Fire Chief. 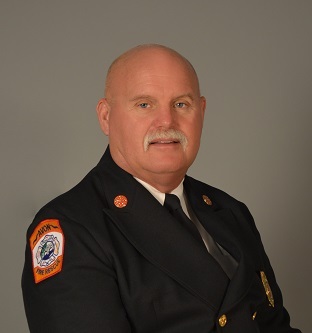 Since coming to the Washington Township/ Avon Fire Department in 1996, Chief has served as a firefighter/EMT, Lieutenant, Battalion Chief, and Chief of the Department.